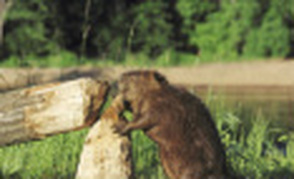 Lake Oswego beaver removal can prevent dangerous trees, flooding problems, and loss of property. Beaver's are natures engineers and are very smart animals that are constantly chewing and damming up water. Controlling beaver's can be a very difficult process if you do not know what you are doing. We have over 30 years of dealing with beaver damage control problems. When removing beaver in Lake Oswego the location of your property can determine the best way to solve the problem. It can be much more difficult in an area that have alot of pets or people traffic. But we are able to provide services for most problems and safety is our number one priority. As mentioned earlier, beavers will never stop chewing down trees, plants and brush which means usually the best method of controlling them is to remove them from the area. They also are always looking to dam up areas when they are in smaller water, because beaver feel alot safer in deep water. If you have any questions or would like more information please contact us at anytime. For Lake Oswego Beaver Removal Call 503-201-2432 Today!